Rashad Anton Evans (born September 25, 1979)  is an American retired mixed martial artist. Evans started his professional career in 2003, he was the Heavyweight winner of The Ultimate Fighter 2 and is also a former UFC Light Heavyweight Champion. The Ultimate Fighter 2 was the second season of the mixed martial arts reality television series The Ultimate Fighter. The season featured a heavyweight and a welterweight division, with 9 fighters initially in each division. The UFC coaches for this season were welterweight and middleweight champions Matt Hughes and Rich Franklin. Season 1 coach and former UFC champion Randy Couture hosted and designed the team challenge segments, which if won would allow the winning team to pair a fighter from their team against another in elimination matches. The finale aired on November 5, 2005, and it set a ratings record for the UFC with a 2.0 overall rating. This season featured no coaches' fight because Hughes and Franklin had refused to fight each other, owing to their friendship. Although released on DVD in 2005, it has been set for re-release on September 18, 2007. Wrestling out of Niagara-Wheatfield High School in Sanborn, New York, Evans twice made it to the state finals tournament of New York by winning his weight class for his county, in which he received All-State honors both times. In 1997 he placed 4th in the state at 145 pounds. In 1998 he placed 4th in the state at 171 pounds. In 1999 he entered the National Junior College Athletic Association National Championships for the 165 pound weight class in which he finished in 4th place. Competing once again at this tournament in 2000, he was the champion of the 165 pound weight class. Sanborn is a hamlet in the Towns of Cambria, Lewiston, and Wheatfield, New York, USA, on the southern side of the intersection of New York State Route 429 and New York State Route 31. Originally called South Pekin after the formerly thriving hamlet of Pekin to the north, Sanborn was renamed in 1866 after Ebenezer Sanborn. The ZIP code for Sanborn is 14132. Gerald Harris is a retired American mixed martial artist and current stand-up comedian, who most recently fought in Bellator. He was a cast member of Spike TV's The Ultimate Fighter 7 and has also competed in World Series of Fighting, the UFC, DREAM, the Portland Wolfpack in the IFL, Shark Fights, Tachi Palace Fights, and Legacy Fighting Championship. 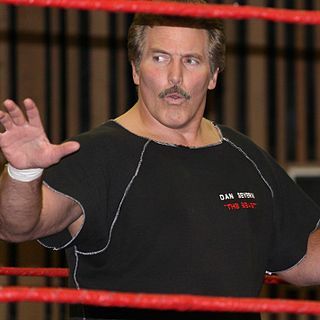 In 2004, under the tutelage of future UFC Hall of Famer Dan Severn,  Evans competed in five professional mixed martial arts fights, winning all five. This led to his selection as one of the nine heavyweights to compete on The Ultimate Fighter 2 , a reality TV series on Spike. The season began airing on August 22, 2005, culminating in a live finale between the final two fighters of each weight division, held in Las Vegas, Nevada, on November 5, 2005. 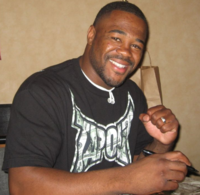 Rashad Evans is also a black belt in Gaidojutsu and BJJ, and studied karate as a child. The UFC Hall of Fame is a hall of fame which honors mixed martial artists and MMA personalities, established and maintained by the U.S.-based mixed martial arts promotion Ultimate Fighting Championship. In addition to the Ultimate Fighting Championship, the UFC Hall of Fame recognizes accomplishments from Pride Fighting Championships, World Extreme Cagefighting and Strikeforce; all of which are former mixed martial arts promotions that have been bought-out by the UFC and its parent corporations. Daniel DeWayne "Dan" Severn is an American semi-retired mixed martial artist, professional wrestler and occasional actor. A UFC Hall of Fame member, Severn is considered one of the leading pioneers of mixed martial arts and the first true world-class wrestler to compete in the Ultimate Fighting Championship. He is best known for his success in the early years of the UFC where he became the first and only UFC Triple Crown champion and the only man to win a world title and a tournament, having won the UFC Superfight Championship and the 1995 Ultimate Ultimate tournament. Severn has also competed in King of the Cage, PRIDE FC, Cage Rage, WEC, RINGS and MFC, and holds a professional MMA Record of 101–19–7. At 5 feet 10.5 inches (1.791 m) and 225 pounds (102 kg), Evans was the shortest and the second-lightest of the nine heavyweight competitors. He was considered the underdog in each of his fights, but made it to the finals by defeating Tom Murphy, Mike Whitehead, and Keith Jardine all by decision. During his tenure on the show, Evans was criticized by opposing coach Matt Hughes for his showboating during fights, but the two eventually settled their differences, and Hughes even cornered Evans for his semifinal bout. In the finale, Evans defeated 6 ft 7 in (2.01 m) Brad Imes by split decision, thus winning a three-year, six-figure contract with the UFC and a brand new car. After The Ultimate Fighter, Evans joined Greg Jackson's Submission Fighting camp along with fellow competitor Keith Jardine, who would eventually become his training partner and good friend. Michael Joe Whitehead is a former professional mixed martial artist. He competed in the Light Heavyweight and Heavyweight weight classes for the Ultimate Fighting Championship, IFL, Affliction, and Strikeforce. Keith Hector Jardine is an American actor and retired mixed martial artist who most notably competed in the UFC and Strikeforce. Jardine was known for upset victories in bouts he took at short notice against highly rated fighters. His best wins were in contests with former UFC Light Heavyweight Champions and UFC Hall of Famers Chuck Liddell and Forrest Griffin. Jardine's unorthodox attacking style wrongfooted opponents, but left him vulnerable in some career-crucial contests, and by his mid-30s he had effectively retired from competing to concentrate on a 'Paleo' business venture. Building on experience as a stuntman and in non-speaking parts, Jardine has established himself as an actor in film and television. Matthew Allen Hughes is a retired American mixed martial artist with a background in wrestling. He is a two-time UFC Welterweight Champion, UFC Hall of Fame inductee, and NJCAA Hall of Fame inductee. During his tenures in the Ultimate Fighting Championship, Hughes put together two separate six-fight winning streaks, defeated all the available opposition in the welterweight division, and defended the belt a then-record seven times. Hughes was inducted into the UFC Hall of Fame in May 2010 during the UFC Fan Expo in conjunction with UFC 114. Samuel Earl Hoger is an American mixed martial artist, Poker player, and an actor, most notable for appearing on the first season of The Ultimate Fighter, a reality television series produced by the Ultimate Fighting Championship and broadcast on Spike TV Hoger has trained with Miletich Fighting Systems in Bettendorf, Iowa and is belted in the Miletich Fighting Systems. Hoger is currently teaching and training out of Hoger Mixed Martial Arts in Houston, TX. The debut season of The Ultimate Fighter premiered on January 17, 2005. Sixteen mixed martial arts fighters were invited to participate in the show where they resided together and trained in two separate teams coached by UFC light heavyweight fighters Chuck Liddell and Randy Couture. The teams competed in physical challenges, segments hosted by singer Willa Ford, to determine which had the right to pair one of their fighters against an opponent of their choice in the same weight class, with the loser being eliminated. Three months later, Evans faced Jason Lambert at UFC 63 . Lambert, riding an eight-fight win streak, was seen as Evans' first real test at 205 pounds. Evans controlled the fight from early on, and knocked Lambert out with punches from the mount in the second round. It was his first stoppage victory in over two years. At UFC 73 , Evans squared off against former UFC Light Heavyweight Champion Tito Ortiz. The two competitors fought to a draw as all three judges scored the bout 28–28. Ortiz had won two out of three rounds on all scorecards, but was docked a point for holding the cage fence to defend against a takedown by Evans. Immediately after the fight, Ortiz asked for a rematch. At a press conference following UFC 73, UFC President Dana White promised a rematch, which for various reasons due to with scheduling the fight, didn't occur until 4 years later at UFC 133 . Unable to get a rematch with Ortiz due to scheduling issues, Evans made his debut as a headliner on a pay-per-view event at UFC 78 instead, against fellow undefeated fighter and The Ultimate Fighter 3 winner Michael Bisping. After three close rounds, Evans came out on top on two of the judges' scorecards, winning by split decision. This fight marked Bisping's first loss and his final bout in the light heavyweight division. After his win over Bisping, Evans drastically changed his fighting style, which he kept secret until his fight against UFC Legend Chuck Liddell. On December 27, 2008 at UFC 92 , Evans faced champion Forrest Griffin for the UFC Light Heavyweight belt. Griffin controlled most of the first two rounds with effective striking and low kicks. In the third round, however, Evans caught a low kick and countered with a straight right hand that dropped Griffin. Evans followed Griffin to the ground and eventually managed to finish the stunned champion with punches inside Griffin's guard. With the victory, Evans became the new UFC Light Heavyweight Champion. It capped off a year in which Evans won Fighter of the Year honors from Sherdog.com. Evans's first defense of the UFC Light Heavyweight title against challenger Lyoto Machida ended in a knockout. During a flurry of punches from Machida, Evans started trash talking Machida telling him 'his hands were made of pillows'. Machida continued his onslaught, knocking the champion out. Evans' timely photograph of his face during the knockout became an infamous meme called "Shad face" amongst MMA fans. This was the first loss of his career and the 15th straight win of Lyoto Machida's career. Then, Evans went on to coach against Rampage Jackson in The Ultimate Fighter: Heavyweights . Evans was scheduled to fight Jackson on December 12, 2009 at UFC 107 , but this was canceled due to Jackson being cast for the A-Team movie. On September 22, 2009, Jackson wrote in a blog on his website that he is "done fighting" because of events that occurred between Jackson and Dana White, the president of the UFC. Thiago Silva was named as Evans' next opponent at UFC 108 . Evans/Jones was expected to take place on August 6, 2011 at UFC 133, but Jones was sidelined with a hand injury. Evans was expected to face rising prospect Phil Davis at the event instead. A title fight between José Aldo and Chad Mendes was delayed, so the UFC promoted Evans vs. Davis to serve as the main event. However, with less than four weeks until the event, Davis pulled out of the bout citing a knee injury. A rematch with Tito Ortiz was scheduled to headline the event. Evans defeated Ortiz at UFC 133 via TKO in the second round. The victory secured Evans a title shot against Jones. Evans and Jones were rumoured to finally clash on December 10, 2011 at UFC 140. However, a lingering thumb injury cost Evans another title opportunity, and he was replaced by Lyoto Machida to fight Jon Jones for the belt at UFC 140. Jones retained the Light Heavyweight belt, defeating the challenger Machida, which left open the possibility of a future fight between Evans and Jones for the title. Evans faced Phil Davis on January 28, 2012 at UFC on Fox 2. He won the fight via unanimous decision. Evans out-wrestled the former division one national wrestling champion landing numerous takedowns throughout the fight. In his second title shot, Evans, at long last, faced UFC Light Heavyweight Champion Jon Jones on April 21, 2012 at UFC 145. Evans lost to Jones via unanimous decision. Evans faced Dan Henderson on June 15, 2013 in the main event at UFC 161. He won the fight by split decision. Evans faced Chael Sonnen at UFC 167 in a Light Heavyweight bout on November 16, 2013 in the co-main event of the evening. He won the fight via TKO in the first round. Evans and his ex-wife  have one son and a daughter. He also has a daughter from a previous relationship  and a son who was born in 2015. Loss 19–8–1 Anthony Smith KO (knee) UFC 225 June 9, 2018 1 0:53 Chicago, Illinois, United States Return to Light Heavyweight. Loss 19–6–1 Daniel Kelly Decision (split) UFC 209 March 4, 2017 3 5:00 Las Vegas, Nevada, United States Middleweight debut. Loss 17–2–1 Jon Jones Decision (unanimous) UFC 145 April 21, 2012 5 5:00 Atlanta, Georgia, United States For the UFC Light Heavyweight Championship. Win 17–1–1 Phil Davis Decision (unanimous) UFC on Fox: Evans vs. Davis January 28, 2012 5 5:00 Chicago, Illinois, United States UFC Light Heavyweight title eliminator. Win 16–1–1 Tito Ortiz TKO (knee to the body and punches) UFC 133 August 6, 2011 2 4:48 Philadelphia, Pennsylvania, United States Fight of the Night. Loss 13–1–1 Lyoto Machida KO (punches) UFC 98 May 23, 2009 2 3:57 Las Vegas, Nevada, United States Lost the UFC Light Heavyweight Championship. Win 13–0–1 Forrest Griffin TKO (punches) UFC 92 December 27, 2008 3 2:46 Las Vegas, Nevada, United States Won the UFC Light Heavyweight Championship. Fight of the Night. Win 12–0–1 Chuck Liddell KO (punch) UFC 88 September 6, 2008 2 1:51 Atlanta, Georgia, United States Knockout of the Night. Draw 10–0–1 Tito Ortiz Draw (unanimous) UFC 73 July 7, 2007 3 5:00 Sacramento, California, United States Ortiz was deducted a point in round 2 for grabbing the fence. Win 10–0 Sean Salmon KO (head kick) UFC Fight Night: Evans vs. Salmon January 25, 2007 2 1:06 Hollywood, Florida, United States Knockout of the Night. Win 7–0 Sam Hoger Decision (split) UFC Ultimate Fight Night 4 April 6, 2006 3 5:00 Las Vegas, Nevada, United States Return to Light Heavyweight. Win 6–0 Brad Imes Decision (split) The Ultimate Fighter 2 Finale November 5, 2005 3 5:00 Las Vegas, Nevada, United States Won The Ultimate Fighter 2 Heavyweight Tournament. Win 5–0 Jaime Jara Decision (unanimous) GC 27: FightFest 2 June 3, 2004 3 5:00 Colusa, California, United States Won the Gladiator Challenge Light Heavyweight Tournament. Win 3–0 Keith Jardine Decision (unanimous) The Ultimate Fighter 2 October 31, 2005 (air date) 3 5:00 Las Vegas, Nevada, United States TUF 2 Semi-finals bout. Win 2–0 Mike Whitehead Decision (unanimous) October 17, 2005 (air date) 3 5:00 TUF 2 Quarter-finals bout. Win 1–0 Tom Murphy Decision (unanimous) September 19, 2005 (air date) 3 5:00 TUF 2 elimination round. 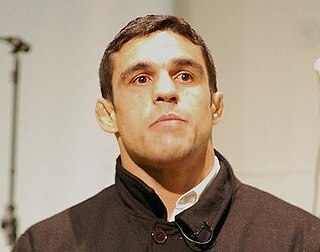 Vítor Vieira Belfort is a Brazilian mixed martial artist, currently signed to ONE Championship. Belfort previously competed for the Ultimate Fighting Championship (UFC), where he fought in the Heavyweight, Light Heavyweight and Middleweight divisions. He is the UFC 12 Heavyweight Tournament Champion, as well as the former UFC Light Heavyweight Champion and Cage Rage World Light Heavyweight Champion. Known for his explosive knockout power, Belfort is tied for second for the most finishes in UFC history with 14. Charles David "Chuck" Liddell is an American mixed martial artist and former UFC Light Heavyweight Champion. He has an extensive striking background in Kempo, Karate, and Kickboxing, as well as a grappling background in collegiate wrestling and Brazilian jiu-jitsu. 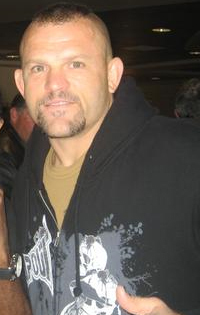 A professional competitor from 1998 until 2010, Liddell had 23 fights in the UFC; along with Randy Couture, he is widely credited with bringing MMA into the mainstream of American sports and entertainment. On July 10, 2009, he was inducted into the UFC Hall of Fame. Forrest Griffin is an American retired mixed martial artist and a UFC Hall of Famer. Since 2005, he has been signed to the Ultimate Fighting Championship where he is a former UFC Light Heavyweight Champion. Griffin, a former Georgia police officer, first rose to prominence after winning the first season of The Ultimate Fighter. In the tournament finals, he fought and defeated Stephan Bonnar in Forrest Griffin vs. Stephan Bonnar, which is widely credited as sparking the current success of the UFC. He went on to serve as a coach on The Ultimate Fighter 7 opposite Quinton Jackson. Maurício Milani Rua is a Brazilian professional mixed martial artist currently competing in the Light heavyweight division of the Ultimate Fighting Championship. A professional competitor since 2002, Rua is a former UFC Light heavyweight Champion and the 2005 PRIDE Middleweight Grand Prix Champion. As of April 16, 2019, he is #13 in official UFC light heavyweight rankings. Thiago Anderson Ramos da Silva is a Brazilian kickboxer and mixed martial artist who competes in the Light Heavyweight division. A professional competitor since 2005, he formerly competed for the UFC, the World Series of Fighting, Absolute Championship Berkut and Pancrase. Glover Lucas Teixeira is a Brazilian mixed martial artist and former member of the Brazilian National Wrestling Team, who currently competes in the Light heavyweight division of the Ultimate Fighting Championship. He has also competed in the WEC, Impact FC, PFC, and Shooto. As of January 28, 2019, he is #11 in official UFC light heavyweight rankings. Chael Patrick Sonnen is an American mixed martial artist currently competing in the light heavyweight division of Bellator MMA. Sonnen has been a professional MMA competitor since 1997. Prior to sigining with Bellator MMA, Sonnen competed for the UFC, where he became a top challenger in both the light heavyweight and middleweight divisions and challenged for both the UFC Light Heavyweight Championship and the UFC Middleweight Championship. Sonnen has also fought in the WEC and in Pancrase. He holds notable victories over Maurício Rua, Yushin Okami, Michael Bisping, Nate Marquardt, Wanderlei Silva, and Quinton Jackson, among others. UFC 94: St-Pierre vs. Penn 2 was a mixed martial arts (MMA) pay-per-view event promoted by the Ultimate Fighting Championship (UFC) on January 31, 2009. The card featured five televised MMA bouts, as well as five un-aired preliminary bouts. It was the second UFC event of 2009 and took place on the weekend of Super Bowl XLIII. UFC 98: Evans vs. Machida was a mixed martial arts event held by the Ultimate Fighting Championship (UFC) on May 23, 2009 in Las Vegas, Nevada. Quinton Ramone Jackson is an American mixed martial artist, actor and former professional wrestler who is currently signed with Bellator MMA. He is a former UFC Light Heavyweight Champion. Due to his eccentric personality and aggressive fighting style, Jackson became a star in Japan during his stint with the Pride FC and following his move to the UFC, he helped pioneer MMA's growth into a worldwide sport. UFC 113: Machida vs. Shogun 2 was a mixed martial arts event held by the Ultimate Fighting Championship on May 8, 2010, at the Bell Centre in Montreal, Quebec, Canada. UFC 114: Rampage vs. Evans was a mixed martial arts event held by the Ultimate Fighting Championship on May 29, 2010 at the MGM Grand Garden Arena in Las Vegas, Nevada. The UFC Fan Expo took place at the Mandalay Bay Convention Center. UFC 128: Shogun vs. Jones was a mixed martial arts pay-per-view event held by the Ultimate Fighting Championship on March 19, 2011, at the Prudential Center in Newark, New Jersey. UFC 133: Evans vs. Ortiz 2 was a mixed martial arts event held by the Ultimate Fighting Championship on August 6, 2011 at the Wells Fargo Center in Philadelphia, Pennsylvania, United States. Chuck "The Iceman" Liddell vs. "The Huntington Beach Bad Boy" Tito Ortiz is a trilogy of mixed martial arts fights between Chuck Liddell and Tito Ortiz; two that took place in the Ultimate Fighting Championship and one in the Golden Boy Promotions MMA promotion. All three fights have ended in a knockout in the Light Heavyweight Division. ↑ T.P. Grant (December 31, 2012). "Rory MacDonald awarded black belt in no gi jiu jitsu". Bloody Elbow. ↑ Gile Huni (July 5, 2015). "Xande Ribeiro On MMA Fighters Getting Promoted Straight To BJJ Black Belt: 'It's A Joke. Respect Jiu-Jitsu'". bjjee.com. ↑ Con, Genghis. (February 10, 2010) Rashad Evans Gets Another Black Belt, This Time From Greg Jackson and Mike Winklejohn HT: Leonard.... Bloody Elbow. Retrieved on 2011-05-06. ↑ "73rd NCAA Wrestling Tournament 2003" (PDF). Retrieved July 10, 2012. ↑ "Long Island Wrestling Association". Archived from the original on August 22, 2012. Retrieved July 10, 2012. ↑ "Rashad Evans Profile". MSUSpartans.com. Retrieved July 10, 2012. ↑ "Rashad Evans MMA Profile". Mmapassport.com. Archived from the original on February 21, 2009. Retrieved March 7, 2009. ↑ "Iceman heats up octagon". Canada.com. September 6, 2008. Archived from the original on September 25, 2008. Retrieved March 7, 2009. ↑ Foster, Eric (September 4, 2008). "Breaking down Chuck Liddell vs. Rashad Evans (from FIGHT! Magazine)". MMAjunkie.com. Archived from the original on March 8, 2009. Retrieved March 7, 2009. ↑ Sherdog.com (April 7, 2006). "Not Enough? Judges Choose Bonnar Over Jardine". Sherdog.com. Retrieved March 7, 2009. ↑ "MMA on DVD: UFC: Fight Night 5 | Inside Fights". Insidefights.com. September 18, 2007. Retrieved March 7, 2009. ↑ "Martial arts' Frank Shamrock tries luck in ring". The Rocky Mountain News. February 2, 2007. Archived from the original on August 27, 2007. Retrieved March 7, 2009. ↑ "Rashad Evans and Tito Ortiz fight to a draw". Blogs.chron.com. Retrieved March 7, 2009. ↑ "Liddell injured; UFC 85 fight against Evans canceled". Ballhype.com. Retrieved March 7, 2009. ↑ Barry, Steve (May 21, 2008). "James Irvin breaks foot, UFC 85 bout with Rashad Evans scrapped". Mmaconvert.com. Retrieved March 7, 2009. ↑ Stupp, Dann (September 7, 2008). "UFC 88 winner Rashad Evans granted title shot with Forrest Griffin". MMAjunkie.com. Archived from the original on March 8, 2009. Retrieved March 7, 2009. ↑ Sherdog.com. "Evans, Mir Crowned; Rampage Gets Revenge". Sherdog.com. Retrieved March 7, 2009. ↑ "Not so fast: Lesnar vs. Mir II and Evans vs. Jackson not official". Five Ounces of Pain. March 8, 2009. Retrieved March 9, 2009. 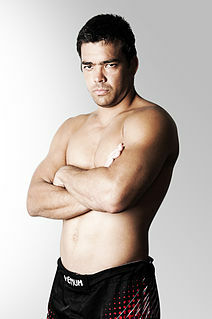 ↑ "Machida mauls Evans to lift UFC title". May 23, 2009. Retrieved May 24, 2009. ↑ Parry, Chris (September 4, 2009). 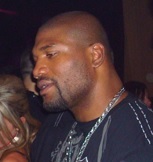 "Former UFC champ Rampage Jackson in Vancouver, set to star in new A-Team movie as BA Baracus". Vancouversun.com. Retrieved September 8, 2009. ↑ "Rashad Evans vs. Thiago Silva set for UFC 108 co-main event in January". mmajunkie.com. October 2, 2009. Archived from the original on October 4, 2009. Retrieved October 2, 2009. ↑ "White confirms Jackson's return, says Evans fights "Rampage" with UFC 108 win". Archived from the original on April 10, 2010. ↑ "Rashad Evans Awarded BJJ Black Belt". BJJGrappler.com. Archived from the original on June 12, 2010. Retrieved January 2, 2010. ↑ Rashad Evans receives his BJJ black belt from Rolles Gracie: "In Las Vegas for UFC 108. Just.... Bloody Elbow. Retrieved on May 6, 2011. ↑ "UFC 108 Results: Rashad Evans defeats Thiago Silva by decision, but almost gets KO'd in the 3rd round". Archived from the original on April 3, 2012. 1 2 "Rashad Evans vs. Quinton "Rampage" Jackson Likely for UFC 113 in May". mmafrenzy.com. Retrieved January 3, 2010. 1 2 "UFC 114 official for May 29, Rashad Evans vs. Quinton Jackson headlines". mmajunkie.com. Archived from the original on March 22, 2010. Retrieved March 18, 2010. ↑ "Dana White looks back at UFC 114: Rampage vs Evans". 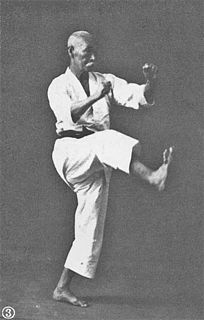 LowKick.com. May 28, 2010. Retrieved May 28, 2010. ↑ Mauricio "Shogun" Rua vs. Rashad Evans UFC title fight on hold until mid-2011 Archived March 3, 2011, at the Wayback Machine . MMAjunkie.com (August 24, 2010). Retrieved on 2011-05-06. 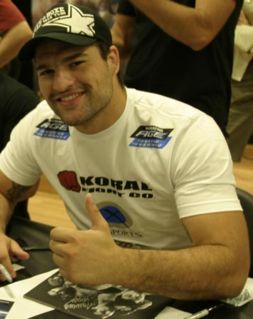 ↑ "Shogun vs. Evans, Ortiz vs. Nogueira Moved to UFC 129 on March 19 in Newark". Mmafrenzy.com. Retrieved December 15, 2010. ↑ "Rashad Evans hurt, Jon Jones now challenges Shogun Rua for title at UFC 128". ↑ Morgan, John. (March 18, 2011) UFC boss says Evans up next; former champ, Jones refuse to look past "Shogun" Archived August 20, 2011, at the Wayback Machine . MMAjunkie.com. Retrieved on 2011-05-06. ↑ Rashad Evans: I'm Done With Greg Jackson's Gym. MMA Fighting. Retrieved on May 6, 2011. ↑ "No Love Lost for Jon Jones, New Team Renews Rashad Evans for UFC 133". MMAweekly.com. July 28, 2011. ↑ "Jon Jones injured, Phil Davis vs. Rashad Evans now targeted for UFC 133". mmajunkie.com. April 25, 2011. Archived from the original on August 17, 2011. ↑ "Jon "Bones" Jones Injured, Rashad Evans Faces Phil Davis at UFC 133". MMAWeekly.com. April 25, 2011. ↑ "UFC 133: Tito Ortiz accepts fight against Rashad Evans for Aug. 6 in Philadelphia". mmamania.com. July 13, 2011. ↑ "Sources: Rashad Evans, Phil Davis set". espn.go.com.com. November 30, 2011. Retrieved November 30, 2011. ↑ Myers, Thomas (January 28, 2012). "Jon Jones vs Rashad Evans main event set for Atlanta on April 21". mmamania.com. Retrieved January 28, 2012. ↑ "'Lil Nog' decisions Rashad Evans in snoozer" . Retrieved February 3, 2013. ↑ John Morgan (March 5, 2013). "UFC 161 set for Winnipeg with Henderson-Evans targeted". MMAjunkie.com. Retrieved March 5, 2013. ↑ Dave Reid (September 4, 2013). "Chael Sonnen vs Rashad Evans Now Official For UFC 167 On November 16th". mmainsider.net. Archived from the original on November 7, 2013. Retrieved September 4, 2013. ↑ "Rashad Evans announces he's fighting Daniel Cormier at UFC 170 in Feb". msn.foxsports.com. December 6, 2013. ↑ Kevin Iole (February 12, 2014). "Rashad Evans injured, bout at UFC 170 with Daniel Cormier canceled". Yahoo! Sports. ↑ Townsend, Adam. "Rashad Evans Seriously Injured". MMA News Now. ↑ Holland, Jesse (October 20, 2014). "Alexander Gustafsson vs. Rashad Evans in the works for UFC main event on Jan. 24 in Sweden". mmamania.com. Retrieved October 20, 2014. ↑ Staff (November 5, 2014). "Rashad Evans out of proposed fight with Alexander Gustafsson in January". foxsports.com. Retrieved November 5, 2014. ↑ Marc Raimondi (December 20, 2014). "Rashad Evans vs. Glover Teixeira to headline UFC's first trip to Porto Alegre, Brazil". mmafighting.com. Retrieved December 20, 2014. ↑ Staff (February 18, 2015). "Rashad Evans out another six to seven months after second knee surgery". mmajunkie.com. Retrieved February 18, 2015. ↑ MMA Fighting newswire (July 8, 2015). "Rashad Evans to clash with Ryan Bader at UFC 192 in October". mmafighting.com. Retrieved July 8, 2015. ↑ Ben Fowlkes (October 4, 2015). "UFC 192 results: Ryan Bader shuts down Rashad Evans, gets unanimous decision sweep". mmajunkie.com. Retrieved October 4, 2015. ↑ Guilherme Cruz (January 27, 2016). "Rashad Evans vs. Shogun Rua targeted for UFC on FOX 19". mmafighting.com. Retrieved January 27, 2016. ↑ Staff (March 9, 2016). "Glover Teixeira in for injured 'Shogun' Rua vs. Rashad Evans at UFC on FOX 19 in Tampa". mmajunkie.com. Retrieved March 9, 2016. ↑ Staff (March 15, 2016). "'Shogun' Rua vs. Corey Anderson set for UFC 198 in Curitiba". sherdog.com. Retrieved March 15, 2016. ↑ Steven Marrocco (April 16, 2016). "UFC on FOX 19 results: Glover Teixeira blasts Rashad Evans for first-round knockout". mmajunkie.com. Retrieved April 16, 2016. ↑ Nick Baldwin (August 15, 2016). "Tim Kennedy vs. Rashad Evans in the works for NYC's UFC 205". bloodyelbow.com. Retrieved August 15, 2016. ↑ Jose Youngs (November 8, 2016). "Rashad Evans pulled from UFC 205 fight against Tim Kennedy". fansided.com. Retrieved November 8, 2016. ↑ Ariel Helwani (November 8, 2016). "Rashad Evans vs. Tim Kennedy fight scratched from UFC 205". mmafighting.com. Retrieved November 8, 2016. ↑ Mike Bohn (November 9, 2016). "Rashad Evans vs. Tim Kennedy rescheduled for UFC 206 in Toronto". mmajunkie.com. Retrieved November 9, 2016. ↑ Steven Marrocco (November 21, 2016). "Manager: Rashad Evans not cleared to fight at UFC 206". mmajunkie.com. Retrieved November 21, 2016. ↑ Tristen Critchfield (November 26, 2016). "Pending commission approval, Tim Kennedy vs. Kelvin Gastelum set for UFC 206". sherdog.com. Retrieved November 26, 2016. ↑ Jesse Holland (February 1, 2017). "Rashad Evans vs. Dan Kelly set for UFC 209 in Las Vegas". mmamania.com. Retrieved February 1, 2017. ↑ Dave Doyle (March 4, 2017). "UFC 209 results: Dan Kelly grinds out decision over Rashad Evans". mmafighting.com. Retrieved March 4, 2017. ↑ Danny Segura (June 23, 2017). "Rashad Evans vs. Sam Alvey set for UFC Fight Night 114 in Mexico City". mmafighting.com. Retrieved April 23, 2017. ↑ "UFC Fight Night 114 results: Sam Alvey outpoints Rashad Evans for split-decision win". MMAjunkie. August 6, 2017. Retrieved August 6, 2017. ↑ Brett Okamoto (March 12, 2018). "Rashad Evans fighting Anthony Smith at UFC 225". espn.com. Retrieved March 12, 2018. ↑ "UFC 225 results: Anthony Smith knee lays out Rashad Evans cold in 53 seconds". MMAjunkie. June 9, 2018. Retrieved June 10, 2018. ↑ Alexander K. Lee (June 25, 2018). "Rashad Evans announces retirement from MMA". mmafighting.com. Retrieved June 25, 2018. ↑ "Rashad Evans and LaToya Evans". FabWags.com. June 1, 2013. ↑ "ATHLETE OF THE YEAR: Evans uses instincts to rise up in UFC". Niagara-Gazette.com. January 1, 2009. Archived from the original on September 5, 2012. Retrieved January 1, 2009. ↑ "Lance Evans". MMA on Tap. Retrieved March 7, 2009. ↑ RSS feed (November 6, 2008). "Microsoft Commercial: 'My Name Is Rashad Evans. I Am a UFC Fighter". Mma.fanhouse.com. Retrieved March 7, 2009. ↑ Rashad Evans – Sherdog’s Fighter of the Year. Sherdog.com. Retrieved on May 6, 2011. ↑ Evans Talks KO – Sherdog’s Knockout of the Year. Sherdog.com. Retrieved on May 6, 2011. ↑ 2008 FIGHT! Awards Archived October 4, 2011, at the Wayback Machine . FIGHT! Magazine (May 11, 2008). Retrieved on 2011-05-06.